Gujarat University External Exam Admission, Gujarat University Exam Form 2018, Gujarat University BA, MA, BCom, MCom External Exam Form: Gujarat University published Notification regarding External Exam form for academic year. Candidates who want apply for Gujarat University Exam Form | BA, MA, BCom, MCom External Exam Form go on official website gujaratuniversity.ac.in. Gujarat University conduct exam on April-May months on November-December months every year. University invite students for apply BA, B.Com, MA, M.Com external semester 1,2,3,4,5, and 6 courses. Students who are not able to continue study as Regular Students they all are apply for Gujarat University Exam Form 2018. 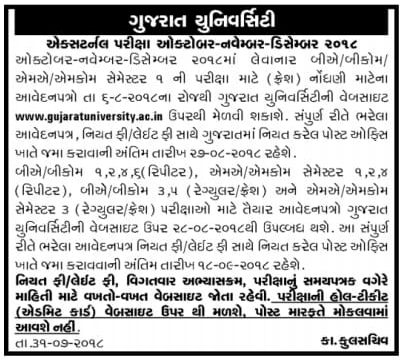 Gujarat University conduct exam every year for external students. Students who want to appear in Gujarat University External Exam 2018 they can apply for BA, MA, B.Com, M.Com External Exam Form through online mode on its official website. The Gujarat University published Notification regarding Gujarat University M.A M.Com External Exam Semester-2 & 4 for freshers and repeaters students and semester-3 repeaters Students and also B.A B.Com External Exam Semester-2, 4 & 6 for freshers and repeaters and Semester-5 repeaters Students. Gujarat University conduct Semester-2 & 4 External Exam on April-May months every year and Semester-1 & 3 External Exam on November-December Months. Applicants may download application form and instruction from official website from 11-02-2019 for March-April 2019 Exam. Gujarat University published examination notification regarding March-April-May 2018 external exam. Candidates who want to appear in MA, M.Com (External) Semester- 1 & 3 (repeater) and Semester- 2 & 4 (Fresh & Repeater) and also BA/BCom (External) Semester- 1, 3, 5 (repeater) and Semester- 2, 4 & 6 (Fresh & Repeater) external exam. 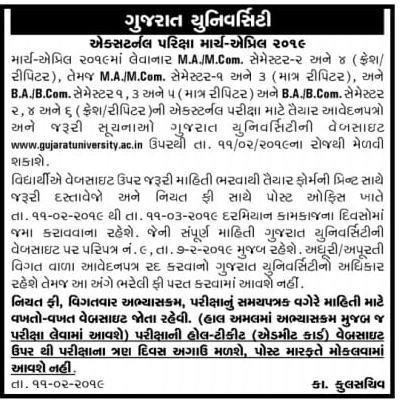 Candidates may read full advertisement detail and examination instruction available from 1st March, 2018 on its official website www.gujaratuniversity.ac.in. Students may read instructions well on official website and apply online for external exam 2017-2018. Application start for November-December external exam from 1st September, 2017. Students have to fill application form and pay fees at post office. Candidates should submit application form with necessary documents at Gujarat University from 1st September, 2017 to 29th September, 2017. Candidates are advise to bookmarks this page and be regular touch on this page for get more latest updates about Gujarat University Exam Form 2018 | BA, MA, BCom, MCom External Exam Form.